Splash Mountain gets the award as my favorite attraction at Tokyo Disneyland. At its heart, it's a log flume ride; "log-rides" can be found at many theme parks around the world, but this one is done Disney style. 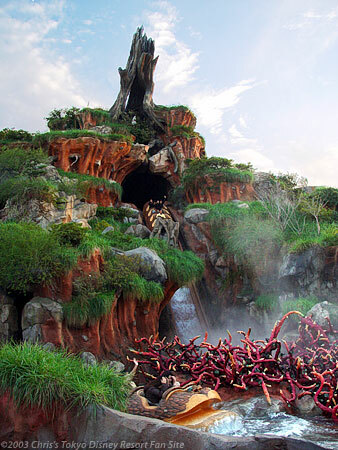 Splash Mountain's theme was taken from the Disney movie, "Song of the South," and is filled with critters from that movie, singing, playing, and occasionally hitchhiking. The main character from the movie, Brer Rabbit, is seen prominently throughout, usually being chased by the not-so-clever fox. Splash Mountain also features a lot of great music, the most notable of which is the classic Disney song, "Zip-A-Dee-Doo-Dah." Although I love the critters, the music, and all the other little touches that make this attraction great, its most prominent feature is a mammoth drop near the end of the ride. The Tokyo Disneyland Guide Map claims that it is the "steepest, highest, wettest drop ever," and I believe it. It's about five stories tall, and set at a 45° angle. About a quarter of the way down the drop you get your picture taken, and you can see the photo when you're exiting the ride. If you want to purchase a copy, you can do so at the Splashdown Photos booth just outside the exit. There is one thing I dislike about Splash Mountain, and it has to do with the aforementioned climactic drop. Because this is a log flume ride, you'd expect that at the bottom of such a huge drop you'd get wet (signs in the queue area warn that that may happen). You do get wet, but it's not from water splashing into the log—you get wet because they deliberately spray you with water at the bottom of the drop. And it's not just a refreshing splash of water, you get ridiculously, ringing wet. Experience has taught me that because of this you should avoid sitting in the front row of the log.